The NYTimes has a good article in search of cellphones that are good at being phones (thanks to winterspeak reader NP from the tip). They review the Motorola C139, Sony Ericsson Z300a, Motorola V195, LG Electronics VX3400, Samsung A420, and Jitterbug. No candy bar Nokias though. The worst phone was the Motorola. Although Moto has had a big hit with the RAZR, I'm not sure they've put as much effort into getting the menu structure of the phone right. The best phone was the LG, although I think my wife has one and I don't find it that easy to use. The Jitterbug was in a class of its own, but the high expense, and coyness about the carrier, means that a normal person really cannot use it. The cellphones are rated on how easy it is to accomplish basic tasks, and battery life (which was often awful) but there was nothing on reception, and little on sound quality -- those are important basics in being a good phone as well. Interesting article about the rise, and quiet retirement, of the Toyota Corolla. I met someone who designs cars who told me that Toyota puts its best engineers, and picks its management, from the Corolla team. Businessweek has a good article on Nintendo's strategy with the (poorly named) Wii. Killer processing power, high-definition graphics, WiFi connectivity, massive storage capacity—when it comes to game consoles, the presumption has always been the more functionality and speed, the better. Well, Nintendo (NTDOY) will launch its next-gen game machine called the Wii in the U.S. on Nov. 19, followed by Japan and Europe in early December. And the Kyoto-based company is making a huge strategic bet that "less is more" in the global game-console market. The Consumer Price Index tries to track inflation by looking at the price of a basket of goods, representing typical household consumption, over time. As the price of the goods rise, inflation rises. But what constitutes a typical basket of goods? A household in the 1950s consumes some of the same things we consume today (washing machine, radio, electricity, housing), but we have lots of things that did not even exist in the 1950s (cell phones, the Internet, medicines etc). So, over time, the "basket of goods" is readjusted to reflect changing consumption patterns, but this then makes it hard to measure inflation. In general, the CPI *overstates* inflation because it does not capture any of the price decline that happens when a new toy is introduced into the market (early cell phones cost thousands of dollars) to when it is within reach of ordinary people. Brad DeLong argues that since an item is not added to a basket of goods until its price falls enough that a typical person buys it, most of the overstating of the CPI falls on the rich -- those are the people who buy fancy new toys initially, so they benefit most from a drop in their price. This makes no sense to me. To me, the biggest life improvements that CPI fails to capture is the gain from something not being available at all (essentially, the cost is infinite), to something being available at all. If a disease had no cure, and now suddenly has a cure, then the benefit of that is immense. So while it is true that the rich benefit most from the price of something falling from $1000 to $100, that benefit is overshadowed by the benefit we all get by that thing existing at all. A country that is so phenomenally more productive than the country of the mid-1970s should be able to do a much better job at providing an economic environment in which all Americans can have greatly improved income security, education for their children, and leisure time, as well as a much greater share in the rises in real material standards of living of which the rich have grabbed the lion's--no, much more than the lion's, the tyrannosaurus's--share. If you asked anyone if they would rather live in 1970 or 2006, the answer would clearly come back 2006. Folks living in 2006 have better health care (both life expectancy and quality of life), funner toys (cell phones, Tivos, Internet), bigger houses, better cars, better food, etc. than people living in the 1970s. And this includes the poorest of the poor as well. 98% of households in the US have cable! Although income volatility may be higher, consumption volatility is lower (thanks to better saving mechanisms), and they clearly have more leisure time as well (given how lifespans are increasing and people are retiring earlier). Is education better? I don't know. I'm told that the government run public school sector is worse, but Universities are certainly richer. Pedant's note: "Lion's share" means the whole thing. I assume Brad means that when he says "tyrannosaurus's share" but he's being redundant -- he was already at 100%. Sprint gave free phones to bloggers. Bloggers try to use phones, hate them, and complain online. There is nothing Sprint can do now to fix the problem being publically aired because the phones have already been shipped. In future, I would recommend that Sprint, other telcos, and handset manufacturers, give phones to normal people *early on* in the design process, *observe* what the customers do with them (what's easy, what's hard, etc.) and then incorporate that feedback to make the phones *better* **before** the design is finalized and they launch. The positive buzz created by quality phones will far outstrip any hype generated by bloggers. These three groups make up less than 50% of the top income group, so CEOs, Wall Street fat cats, and basketball players do not explain the growth at the very top of the income scale -- they don't make up enough of it. The truly amazing historical event is how one hundred years later both India and China would become synonymous with economic underdevelopment, a collapse that was probably caused and simultaneously the cause of European colonialism. Wretchard is incorrect on calling this shift from 50% to 2% a "collapse" -- China and India did not start producing less, the rest of the world (particularly the West) produced more. Moreover, it is difficult to see how European colonialism in India or China could have caused this stagnation. China was never under European colonial rule, and the British invested in Indian infrastructure produced benefits just as their colonial rule produced costs. The Indian and Chinese model of stagnation is normal, and has proved the rule for most of history. It is Western (and now Japanese, Chinese, Asian, Indian, etc.) growth that is the exception. How can Gmail be this bad? I've attached a screenshot from the top of my gmail account. How these spam emails, in in Cyrillic, Chinese, and Japanese (I think) made it through gmail's filters baffles me. Yahoo! mail has much better spam filters. I'm also a surprised that anyone would bother with non-English spam. The response rate to English emails has to be better than Russian emails, so why bother with non-English spam at all? 1) English speakers are savvy about spam now, so although there are fewer Russian and Chinese internet users, they are still more gullible. 2) Gmail is smart about filtering out english spam, but dumb about Russian and Chinese spam. So Russian and Chinese spam is appropriately rare, I just see it more. 3) Russiand and Chinese spammers are still new at the game, and will switch to English once they gain experience. posted by winterspeak at 2:11 PM 0 Comments How can Gmail be this bad? posted by winterspeak at 4:46 PM 0 Comments Honed razor keen or dull and worn out? A nice article on Salon by David Brin on how it is too hard today to find a simple BASIC programming environment that lets high school kids write their own simple programs. I sympathize. Several years ago, for arcane reasons, I tried to write an Enigma machine that would run on my Palm. The programming itself was quite easy compared to getting the development environment running, which was *insanely* hard. On my old BBC Micro model B I just had to turn the machine on and I was ready to go. This article is a great example of why gadget loving techies just don't get it when it comes to consumer electronics in general, and the iPod in particular. The iPod is "under featured" and popular, which means that gadget heads heap scorn upon it. They're welcome to their opinions, of course, but their position is not a common one. Microsoft is coming out with an iPod competitor called the Zune. I don't know much about the player yet, but I'm sure it will have more features than the iPod and be competitively priced. I'm not sure it will do well. If Microsoft listens to gadget heads, then I'm sure it will do badly, just as all the other "cheaper and with more features" iPod competitors have done. •The Zune has a large screen. The 3-inch screen is 50% larger than the 5G iPod's. One of the main complaints iPod users have is that the screen is just too small to watch video on. Umm, the iPod is about listening to music. This is like complaining about a car because it does not have a built-in toaster. •The Zune has community. The WiFi and DJ features will let you share music with other Zune users, meaning there's more reason for you to use the Zune if your friend Steve has one as well. Umm, if something does not work well for an individual, there will never be any community for them to join. •The Zune has Microsoft. Don't doubt the financial backing of the largest software maker. Microsoft could gain market share by selling units at a loss. They could probably gain even more market share if they strapped hundred dollar bills to the Zunes and handed them out on the street. You could then take that money and spend it on a new iPod. •The Zune has the anti-iPod crowd. If you saw through the excitement of the Apple Showtime event yesterday, you'll notice that the iPod didn't really get any significant updates. Brighter screen and longer battery life? New body for the iPod Nano and memory bump? Hard to argue with. The Zune is not an iPod, so anyone who does not want an iPod and wants something else may get the Zune. Or a toaster. You can use a toaster to toast bread -- great feature! •The Zune has a future. To get the Zune out in time for Christmas '06, Microsoft had to partner with Toshiba and use their Gigabeat design as a bootstrap. Cool. I will check it out in the future. I'm not an iPod devotee (although I do like them) nor am I a Microsoft basher. I do find it frustrating that people don't understand what made the iPod so great. The iPod was not the first portable mp3 player out there, nor was it the cheapest, nor was it the most fully featured. It just made it really easy to get all your songs in one place and carry them around with you. The cheaper, more featurific flash based players could only fit about 20 songs, which meant you needed to keep messing about with your USB cable and their crappy software everytime you wanted some new tunes. You just plugged the iPod in, put it on shuffle, and suddenly our life had a sound track. A great experience. Fascinating piece on Natascha Kampusch. 2) I did not know better then, it sounded fine. For three years. 3) The front right speaker keeps failing now for some reason. 4) Not having front right is really annoying. 5) Getting these things hooked up is very hard. Seeing as how I don't have the technical chops to hook these things up, nor the auditory discernment to know whether it's been set up correctly or not, in the future I'm just going to focus on something that is easy to plug in. Apple's recent iTV announcement finally plugs the movies and TV shows you can download from the iTunes Music Store into your TV. It uses wireless technology to transfer the content from your computer to the box, which is fantastic as currently I have yards of cable stretched across my floor. Watching movies or TV shows on my computer or my iPod never made any sense, now I can watch them on my TV without having to buy a Mac Mini. 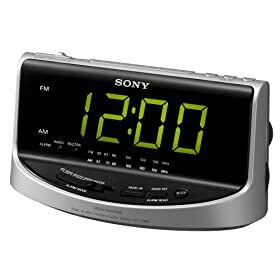 Most alarm clocks have lousy user interfaces. This one above is pretty typical -- a number of tiny, poorly labeled buttons, which for some reason increment minutes in single units (do I want to get up at 7:02AM, or 7:04AM? ), and make little distinction between AM and PM. When at a hotel, I have no confidence that I have set the alarm clock correctly, so I started using my cellphone instead. I'm not sure if this is standard in all Nokias, but my phone makes a much better alarm clock than any alarm clock. You use the actual keypad to type in the time you want (much faster than clicking one button 10,000 times) and then select AM or PM. No ambiguity. Finally, you turn the phone off (so you are not woken by your drunk cousin at 4 in the morning) and the alarm works anyway even though the phone is off. After picking between "stop" and "snooze", your phone asks you if you want to turn it on now. Brad DeLong seems to beleive that spite and envy are created by disparities in visible consumption of goods. I believe that spite and envy are (ugly) parts of human nature, and if they did not manifest themselves through conspicious consumption, they would manifest themselves in other realms with fewer positive side effects, and more negative side effects. Arnold Kling has a nice post on this, looking at status seeking in Brad's neck-of-the-woods, universities. I agree with Arnold -- status seeking is an ugly thing, but best it manifests through something as benign as rich people buying gaudy trinkets to make poor people feel worse, rather than the rigid class-driven status competitions that you see in Europe and the Academy. The ban on liquids and gels on US domestic flights is ridiculous. It means that you need to check bags for a simple overnight journey, adding significantly to the (real) cost of travel. I cannot imagine the restrictions on *everything* in the UK. 2) Go long solid deo, short aerosols and gels. 3) Expect a sudden interest in toothpowder. At some point they will have to choose between making people fly naked, and simply arming every passenger before they board and telling them they are on their own.